Mr. GFE and I had a nice, quiet day at home today. It was a scheduled holiday for him. Not so for me, but I made it one … and that was a great idea! We ate our respective breakfasts … cereal for him and a one egg “omelet” with spinach for me. Then for a mid-morning snack, we ate the last of a weekend batch of the Cinnamon-Sugar-Crusted Popovers. That indulgence, of course, made us not want anything for several hours. When we finally did eat again, instead of a quick, light lunch, I decided to go for something more substantial, but still healthy enough. The refrigerator yielded about a pound of chicken tenderloins (i.e., boneless, unprepared chicken tenders), a small container of coconut, and some cornmeal mix that I’d made for breading chicken earlier. Right then, I decided to make chicken tenders. As an aside, perhaps the coconut idea appealed to me because I had recently read an article on using Girl Scout cookies as breading. I am not making this up. How does Fried Samoas Shrimp sound? The recipe included 5 Samoas, 2 cups bread crumbs, 2 cups flour, 1 cup coconut flakes, 4 egg whites, and cayenne pepper … all as breading for 4, yes, 4, extra large shrimp. Wowser. Nutritional information was not provided, but the recipe said it served 5 … so if you stuck to a serving, you didn’t even get to enjoy one full shrimp! And, of course, samoas are not gluten free, unless you make them yourself, which you can easily do, but I don’t think I’d crumble my cookies and use them to bread shrimp. I do love coconut shrimp but I’m not sure about the chocolate and caramel with my shrimp. Hmmm. Back to the breading I did use … the cornmeal mix had seemed a little bland the last time I had used it with chicken. And, the coconut I had on hand was actually sweetened coconut, which I thought might be cloyingly sweet. So I added some chili powder to each. My original idea was to bread the chicken tenders in the cornmeal mix and then dip them in the coconut, but just one attempt showed me that wouldn’t work. The coconut wouldn’t adhere to the chicken tender after it had been coated with the cornmeal mix. So I dipped half of the tenders in the cornmeal mix alone and the other half in the coconut mix alone. I just dipped the washed, and therefore, wet, chicken tenders into the cornmeal mix or shredded coconut. I didn’t need to dip them in eggs or milk beforehand as the original cornmeal mix recipe stated. Just the wetness from the water worked perfectly well (and omitting those ingredients also makes these tenders dairy free and egg free, and obviously lower in calories). Then I fried them all in some grapeseed oil, and drained them before serving. (Note: This was my first time using grapeseed oil and I liked its lightness and neutral taste very much—plus, its added health benefits.) As you can see, because I cooked the two types of tenders together, they all ended up with a little coconut “breading.” We ate them with a little honey barbecue sauce and a few chips and really enjoyed them. Although I’m providing some ingredients and directions, these are really sort of “improvise-as-you-go” recipes, or as my friend, Erin (Gluten-Free Fitness) likes to say … Not Really A Recipe. When Erin first used that term in reference to her rendition of my Special Turkey Breast, I said something to the effect of “hey, that’s a recipe!” But, then I realized that she used that term as a category on her blog and didn’t mean anything negative at all. Instead, she was demonstrating that so many cooking sessions start out as just a concept or basic method with lots of room for improvisation. She’s totally right. Seize that idea for your cooking and you’ll be a lot happier in the kitchen and end up making some great dishes as well. And, that’s true whether you are gluten free or not. Mix together either the cornmeal breading ingredients or the coconut breading ingredients (or both, separately) and pour into a shallow bowl. 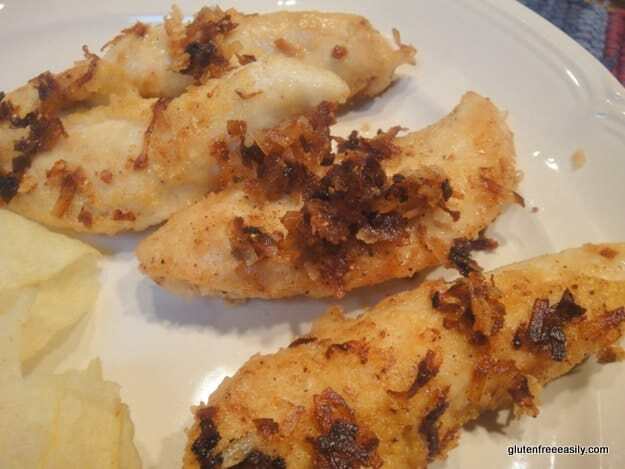 Coat wet chicken tenders with breading mix and fry on medium to medium-high about 8 - 10 minutes on each side..
*I can’t tolerate many of the healthier, gluten-free flours; e.g., sorghum, buckwheat. Therefore, my gluten-free flour mix is 3 parts Asian white rice flour and 2 parts cornstarch. I gently mix three one-lb bags of the Asian white rice flour and two one-lb boxes of cornstarch in a very large bowl and then store the mix in several airtight containers (like large glass jars). It’s a very economical mix that works well in most recipes. No refrigeration is needed.The coconut I used was actually sweetened. (It was left over from making Linda’s wonderful Coconut Cashew Clove Cookies.) So I was worried that these tenders might be too sweet, but the chicken taste itself and the chili powder I added offset the sweetness by just the right amount. The truth is you really don’t have to buy prepared gluten-free breading mixes to end up with delicious results, and just as importantly, you don’t even need a true recipe. I’ve purchased gluten-free offerings in the past like breadcrumbs at $4.00 for 4 ounces and they’ve ended up going to the birds, literally. There are so many other breading possibilities that work beautifully and don’t break the bank. I’ve shared other options here before at gfe, including two possibilities for a similar recipe for our favorite baked chicken nuggets. One used crushed potato chips; the other used crushed cornflakes and lots of seasonings. Ali (Nourishing Meals) did this post a while back with some excellent breading options. I, and several others, contributed additional ideas in comments. Some other easy breading choices that I have used are Parmesan cheese, rice cereal (for babies), toasted and crumbled gluten-free waffles (as shown here), and instant mashed potatoes (my only, occasional use for them). I’ve heard that tortilla crumbs and corn chips make great breading, too. Along those lines, be sure to check out Diane’s (The WHOLE Gang) Frito Fish. So, the message with these chicken tenders is think outside the box and don’t stress. That’s the gfe way. Now, go ahead, have a gluten-free chicken tender … with cornmeal coating, coconut breading, or perhaps your favorite gfe breading. And, what is your favorite breading? Please share! Great ideas Shirley. We have been doing plain old cornstarch for chicken tenders and for chicken chunks since my youngest started making her version of Pei Wei’s GF spicy chicken. Even without the Pei Wei-like sweet, spicy sauce, the cornstarch makes great tenders. I just started using a combo of Glutino’s crumbs(mostly corn-based) and parmesan for great baked boneless, skinless chicken thighs. Hey Wendy–It’s great to see you! 🙂 I remember you talking about your daughter’s version of Pei Wei spicy chicken. It sounded divine. And, how much easier could that be … “plain old cornstarch”? Most of the time we don’t want a heavy coating anyway. Similarly, sometimes I just use my gf flour mix (which contains a lot of cornstarch) and it works fine. The Glutino and Parmesan combo for breading does sound tasty! Thanks for sharing your breading choices, Wendy. I tend to make a lot of breadcrumbs and use those as breading! (most of my breadcrumbs are from failed GF breadmaking experiments, LOL!) 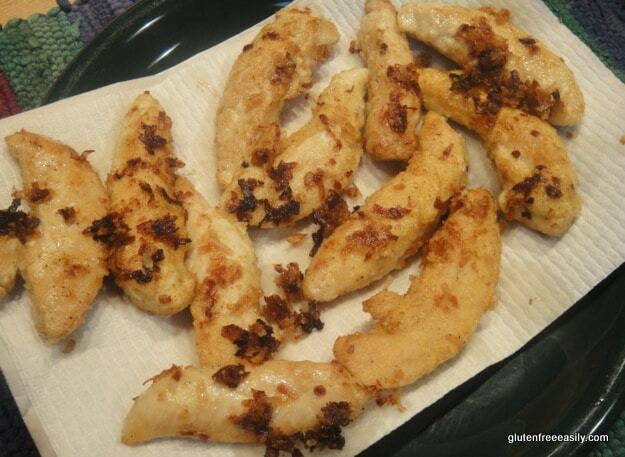 I love your potato chip version though – I’ve made it and the chicken strips are quite good! Hey Alta–Thanks for sharing your input … with some recycling in there, too. 😉 Those failed baked goods always taste extra special when reincarnated I think. Yes, making one’s own breadcrumbs can be a great option. I love the rice chex breading as well. 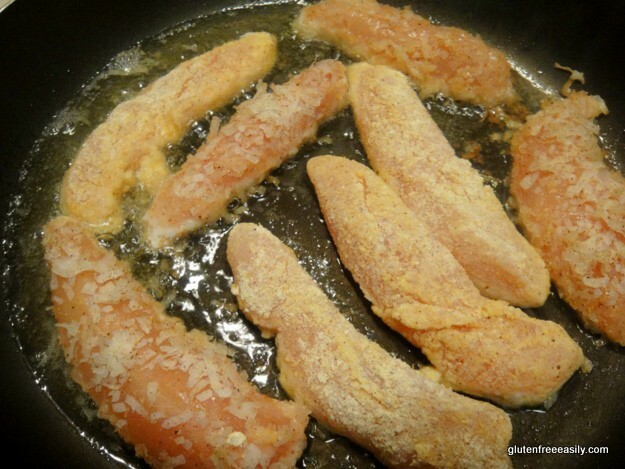 I dip the chicken in olive oil first, then into the Rice Chex crumbs. I bake it at 350 for 50 minutes if I’m using chicken breasts, or slightly less time for chicken tenders. Yummy, and free of Top 8 Allergens! Hi Rebekah–The olive oil part sounds especially good! 😉 As I was telling Kay, I can’t tolerate the “gfree” Rice Chex or the other General Mills gf products. Apparently I’m more sensitive than the less than 20 ppm standard that they are following. Hey Kay–I’m sure many folks will appreciate your info on Rice chex and adding Mrs. Dash, etc. Oooh, on the farm fresh eggs … yep, one can find lots of ways to use those wondrous-tasting eggs. Now, not to be a party pooper, but I don’t eat any of the gluten-free Chex cereals or the Betty Crocker gf mixes (all made by General Mills). Without fail, I’ve gotten sick every single time I’ve tried. As in gluten sick. Others have reported the same, included their gluten issues like dermatitis herpetiformis. But, many others eat them all the time seemingly without issue. So, what does tha mean? Maybe that I and others are more sensitive than the less than 20 ppm standard that GM is supposed to be using? I don’t know … I just know I’m staying away from them. Sorry, my mind is a sieve. My favorite MRS DASH is TABLE BLEND, not Original. Also, forgot that you can’t tolerate the CHEX cereals, Richard seems to be okay with them, but he just told that he has “gone off of them”. He seems to have problems with any of the mixes that are too “cocoa-ey” if that made up word makes sense to you, the dark cake mix or brownie mix. Have you or any of your readers tried MASA HARINA as a coating for chicken? It is gluten free and says so on the package! YAY! I LOVE it when a company has the guts to put the words “gluten free” on their labeling. This reply is too long I know… I would like to ask you if you would be interested in a brownie recipe that uses only 1/2 cup of soy flour. I have made it for company and it is GOOD! Cheers! Kay Hey! Also forgot how to make the smiley face!!! Pretend it’s here okay? Kay–One of my favorite sayings is, “Of all the things I’ve lost … I miss my mind the most.” LOL Thanks for sharing the correct Mrs. Dash info with me and the gfe readers! Interesting on your hubby giving up Chex and the cocoa factor. If they are gluten free, why are any of us having problems with any of their mixes? Masa harina makes perfect sense for breading–thanks for mentioning it! Alta at Tasty Eats At Home just made stunning pancakes using cornmeal with some masa harina in the mix as well. You make the smiley face just like you would in an email. Type a colon, then a dash, then a right paren (with no spaces in between) and that code gets converted to a smiley. Both sound GREAT!!! I’ll have to try them with both. We also have used the rice chex breading here. It turned out nicely – the kids like it. It’s definitely important to come up with breading the kids like. 🙂 And, it’s great to use a breading you can make from ingredients on hand all the time, so you don’t have to make a special run to the store. Ooooh, coconut and chili powder? You’ve hit on two of my favorite flavors. I never would have tried putting them together on a “breading.” Hmmm? Good one, Shirley! Very creative! I will definitely be trying this one. Sounds absolutely delicious. I’ve been out of town lately and out of the blogging loop. Must catch up. Off to check out your Flourless Sparkling Chocolate Cookies. You are definitely the queen of flourless treats! When is the cookbook coming out!? You’re such a great cheerleader for a girl … clearly, you’ll have to be in the dedication when I write my cookbook! Thanks, dear. That chicken looks very good. You got me thinking about chicken now too. LOL. Those look great! I’m so glad I’m making chicken tonight. Thanks for the shout out. I’ve not made Frito Chicken of Frito Fish in some time. Might need to break that one out again. What is it about fried chicken that drives us all nuts and makes us feel like kids? Hi Diane–Mr. GFE bought a bag of Fritos recently … the first one we’ve had in our house in years. Usually it’s just tortilla chips or potato chips. Son and his friend ate most of them with their lunch and then Mr. GFE and I had a few later. Frito-Lay was the company that had the slogan, “Bet you can’t eat just one.” … I think. It certainly holds true. That’s why Fritos rarely make an appearance in our house. 😉 Fried chicken … it’s just a mind-, stomach-appealing combination of fat, salt, and crunch. LOL Hope you enjoyed being a kid again last night! I’m with Geri – both sound great! I heard the funniest thing the other day – did you know that McDonald’s uses food GLUE to keep the skin from pulling off of their chicken nuggets? I had never heard of such a thing until a friend told me he might use it for his BBQ contests! HI Karen–Thanks so much! 🙂 I laughed when I read your McDonald’s info. No, I had no idea that McDonald’s used food glue on their chicken nuggets. But, honestly, I can’t say that it really surprised me. They are the folks who added sugar to French fries, right? And, it seems that food glue is really sugar glue. Check out this video on making edible sugar gluten. It’s rather sad really … most have gone so far over for foods that look a certain way that they totally forget about what’s in the food. Organic fruit from your guy at the farmer’s market can get discounted because it’s smaller and not “perfect” like the wax-coated, non-blemished, and ancient apples in the grocery store. Yikes. How nice! Both sound great =D. Mom likes to make them with crushed cornflakes, but I might try the coconut ones – at least once ;D.
I’ve used a variety of flours and crumbs for breading. You’re right. It’s easy to come up with something that works. I think your coconut version sounds good. Hi Linda–Thanks! I’m glad you’ve found the same to be true. 🙂 I just hate when we think we have to depend upon products and keep our pantries, etc. stocked with them, when we often have so many possibilities right at hand and might actually throw them away (e.g., potato chip and tortilla chip crumbs) if not used for breading. I was surprised just how easy the coconut version was to make. Hey Anali–Hope you enjoy your chicken tenders! I look forward to your rendition. You are a great “improviser.” I remember your comments in one post about not getting hung up on performing recipe steps in exactly a certain order, etc. I so agree! And, I have the same issue with writing measurements down. Even when I do, it’s very common for me to have to search for those pieces of paper. Then when I find them, I have to decipher my chicken scratch (I do not write neatly at all while cooking at the same time). Somehow it all works out though.